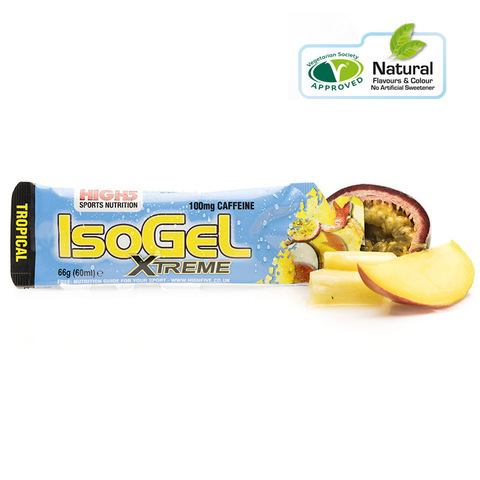 Home › IsoGel X’treme: Energy gel with fruit juice and 100mg caffeine. 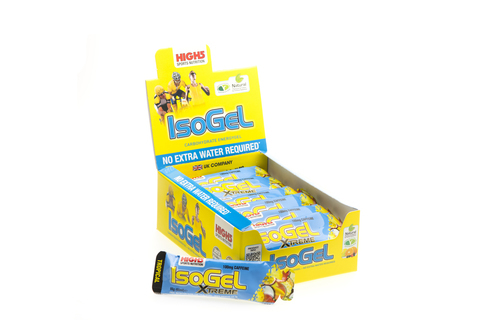 IsoGel X’treme is the new high caffeine gel. Use IsoGel X’treme as a caffeine hit for that extra edge before and during your training session or race. Each sachet delivers 23g of carbohydrate energy and a high dose of caffeine (100mg). When taking part in tough sports events, caffeine contributes to an increase in endurance performance and capacity¹. That means you can go further than before! It also helps to increase concentration and reaction time². Consume as part of a varied and balanced diet and a healthy lifestyle. ¹Caffeine contributes to an increase in endurance capacity. Consume 3 mg/kg body weight caffeine at least one hour prior to exercise and avoid caffeine consumption for at least 12 hours prior to consumption. It is recommended to not exceed a daily intake of 400 mg of caffeine from all sources. ²Caffeine helps to increase alertness and improve concentration. 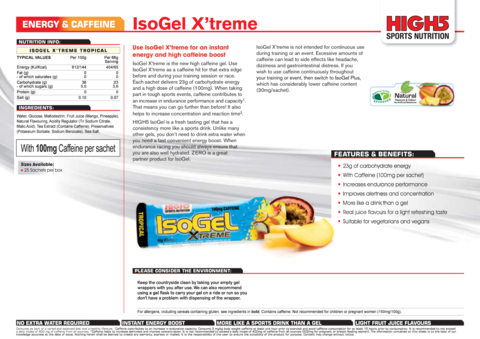 It is not recommended to exceed a daily intake of 400mg of caffeine from all sources (200mg for pregnant or breast-feeding women).